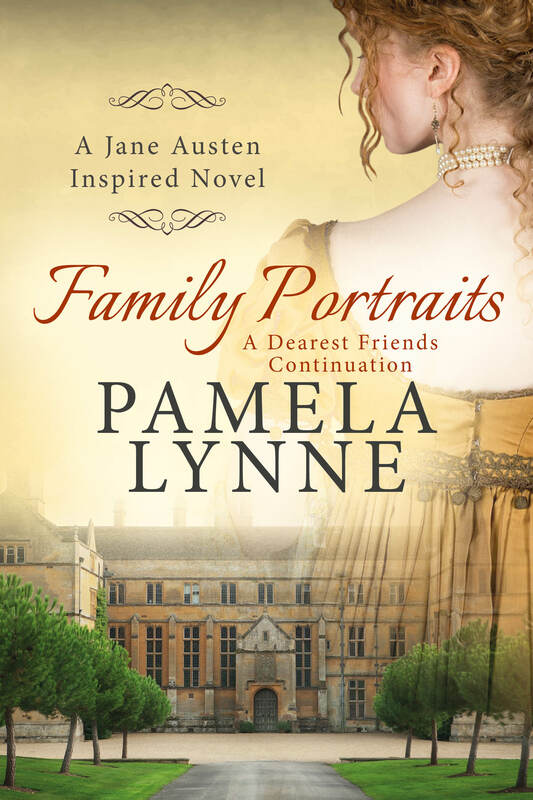 Today I’m very happy to receive for the first time in From Pemberley to Milton author Pamela Lynne. I’ve heard so much about her and her books, but unfortunately haven’t read any of them yet. I have heard wonders about Sketching Character and I have it on my TBR pile for months! Now she has released Family Portraits which is a continuation of Dearest Friends and I found myself with another book on the must read list. Thank you so much, Rita, for hosting me here at From Pemberley to Milton. This is my first visit to your lovely blog, and I am so excited to share a couple of my favorite people with you today. 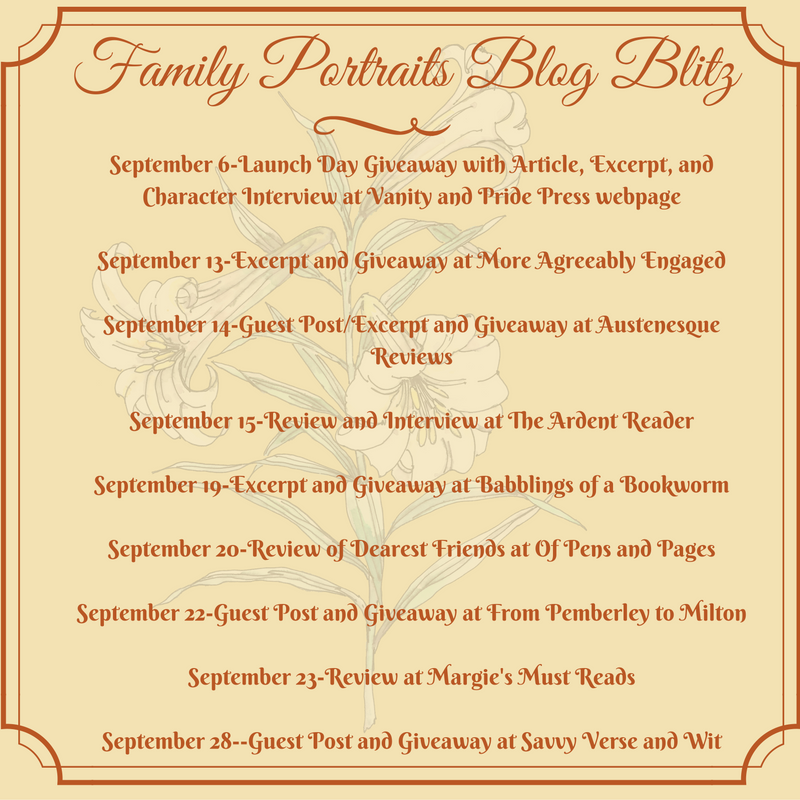 I first found JAFF and the world of Austenesque literature a little more than four years ago. For months, I devoured every book I could find before I started jotting down ideas for what would become Dearest Friends on a notepad I kept by the bed. I still have those pages. I came across them recently when I was cleaning out my abandoned crafts cabinet. As I read over them, I noticed that, other than Darcy and Elizabeth’s initial meeting, all my early notes were about the side characters—those who would support D&E on their journey to happily ever after. One of the reasons we all love JAFF, I believe, is that we have an instant emotional connection to the main characters. We love Darcy and Elizabeth, and we cannot get enough. For an author, that is both a blessing and a curse. Having that connection is vital to the success of any novel, but it also means we have a lot to live up to. We all have our own preconceived notions about Canon and who Darcy and Elizabeth are and how they should behave. Changes to the personalities or behaviors of ODC can be a hard sell and doing too much can be detrimental to the book’s success. I believe a strong creative power we JAFF authors have at our disposal is the freedom to tweak Austen’s supporting characters. As many of you already know, I took a great deal of liberty with some characters in Dearest Friends, namely Mr. Bennet and Jane. We see enough of them in Canon, I believe, to justify any prejudices we have against them or any love we have for them. The same cannot be said for Anne de Bourg and Mary Bennet. We see so little of them, and what we do see is not always positive. But, surely, there’s more to explore there. In both Dearest Friends and Family Portraits these two women, who were relegated to the background in Pride and Prejudice, had a chance to shine. Mary sat next to her friend, who had removed herself from the party to rest in the shade of a tree, watching the men and children race on the lawn. Mary said nothing, only placed her hands in her lap and waited. Eventually, she heard her companion sigh. Mary did not answer, not wanting the conversation to turn too serious. Anne would not let it be, however. Mary’s composure cracked as Anne made kissing noises, and they both collapsed into a fit of giggles. It makes perfect sense to me that these two should be friends. In Canon, they are miles apart and never meet. In the what-if, however, they become strong characters who are far more than their wallflower status. I hope you agree with me. Who are your favorite supporting characters? Are there any you feel and underutilized in JAFF. I’d love to hear what you think! Follow Pamela Lynne’s advice and tell us who your favorite supporting characters are. Tell us why you like one character, or why you dislike another. You can also share your thoughts on this post because all comments will entitle you for the giveaway of one e-book that Mrs. Lynne would like to offer to one lucky reader. The giveaway is international and is open until the 3rd of October. How fun to see both Anne and Mary like real people! Well, I am partial to Georgiana, mostly. Can’t even explain why, I just am. But yes, it is true, supporting characters in cases such as P&P are an incredible way of expanding the story beyond the main plot and a pleasure to imagine because not much of them is shown. I am quite curious about this one, truly! How interesting that Anne and Mary are so good for each other. Anne and Charlotte always seem to be the more obvious connection due to their circumstances. I agree with Glynis that M/M Gardiner are interesting due to their kindness to Jane and Elizabeth and clear affection for each other. Their backstory I imagine as pretty romantic. Another book on my TBR, hooray! My favourite supporting character will always be Caroline Bingley. I’m not saying she’s secretly good inside, or the opposite– that she’s the ultimate villain. But her character has so much potential! She’s really driven, and she’ll give it her all, no matter how misguided. Whether portrayed as good or not, she can “support” the main characters by showing how they’ll react to her. It’s exciting! You and Lynn are making me rethink about Caroline’s character Laurie! It’s true, she has been portrayed in so many ways, and there is so much potential to make her completly evil, or good at heart that she probably is one of the most interesting characters to develop. Much more interesting than Jane Bennet, for exemple. Thanks for your comment, I really liked Reading your thoughts on this. This sounds delightful! My favorite secondary character is Colonel Fitzwilliam (though that might be because of all the JAFF I’ve read with him at the forefront). And I love to hate Caroline Bingley and Lady Catherine. Colonel Fitzwilliam is also my favourite Anna, along with Mary, who is my favourite Bennet sister. You can imagine what I thought about When Mary Met the Colonel right? I have a soft spot for Charlotte!! I think she’s incredibly shrewd,after all she’s the only one that hints to Lizzy that Darcy is attracted to her,hence his frequent calls to the Parsonage and his repeated delayed return to London. Of course Lizzy rejects this as absurd,but an an outsider looking in,Charlotte has a different perspective. Of course Chatlotte serves as a constant reminder of what Lizzy could have become had it not been for his letter that serves to clarify so many misunderstandings and perceived prejudices. This leads them to a new understanding and ultimately they realise they are the perfect foil for each other. Really enjoyed the excerpt. Thanks to all concerned. I like Charlotte as well Mary, even if she is not a favourite of mine. It is curious how the person who willingly chose to spend the rest of her life with William Collins is portrayed as the wise one in many JAFF books isn’t it? Have you ever thought about that? Favourite supporting male character: Mr Bennet. Unless you really think about how neglectful he has been to his family, he is quite lovable! LOL! Favourite supporting female character: Charlotte Lucas. She understands Elizabeth, and Darcy, long before Elizabeth does. And she certainly knows herself, which is more than Elizabeth can say until after she is put in her place by Mr Darcy’s letter. Many thanks for the excerpt and the giveaway! I cannot tell you how long I have been anticipating this book’s release! I love your books! Great excerpt, love the bond between them. I always enjoy reading more about Col Fitzwilliam & Anne when they have more active roles. Do you like when there a love interest between them Dung? He gets paired off with many characters, and even if I like him with Anne, I always prefer to see him with Georgiana, for exemple. I actually prefer they have different love interest then within first cousins. I’m not a big fan of when Col Fitzwilliam and Georgiana end up together. I know it was popular back then for first cousins to marry, but it’s never sat comfortable with me because he was her guardian and they is such a large age gap. I’ve read many novels that is done tastefully, but still prefer otherwise. I am partial to Colonel and Mary too Lis. With whom do you usually like to see Colonel Fitzwilliam get his HEA? I love all your answers and find it curious that one person has been left out entirely–Lydia! She was featured heavily in Sketching Character and a good bit in Family Portraits as well. To me, she’s the typical teenager who has been left to her own devices far too much. I think there’s great ‘what-if’ potential there. I adore Colonel Fitzwilliam (in spite of what you read in Sketching Character) and have great plans for him in my next work. I also like reading about the implied characters–the elder Fitzwilliam brother and other Lucas siblings. On the flip side, a character I do not like is Kitty Bennet. I kept losing her in Family Portraits! Thanks for all the wonderful comments. Good luck in the giveaway! My favorite character is Col. Fitzwilliam. He is such a wonderful character and I enjoy all his interactions with Darcy. I only wish he wasn’t made into a love interest for Elizabeth so often in jaff.